Thanks for fan Heady’s suggestion. Now we name the visor as they should be. There were two kinds of visors in our inventory, Type I and Typy II. Please note that they are different sizes format and they ain’t applicable to both. The Type I visor(Binocular visor and Sun Visor). I named it “Type I” because of it’s my first custom visor and come out in the end of 2007. It was made for fit with my custom clone helmet. 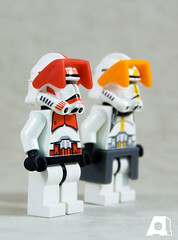 And the custom helmets make based on official EP3(phase II) clone helmet. So the Type I visor can fit with official helmet if the helmet made a little modification. The Type II visor(Binocular visor and Sun Visor). 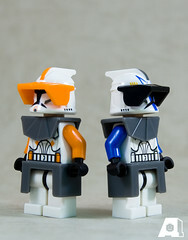 It’s my latest custom visor and it easy to fit well with official new clone helmet(phase I). You don’t need to make any thing for your helmet.